Attorney General Pam Bondi is a fourth-generation Floridian who spent more than 18 years as a prosecutor trying cases ranging from domestic violence to capital murder. She received her Bachelor of Arts in Criminal Justice from the University of Florida and her Juris Doctor from Stetson Law School. She had never run for elected office, but as a career prosecutor, knew she wanted to make a larger, more positive impact to help Floridians statewide. In 2010, she ran for Attorney General, becoming the 37th and first female Attorney General in Florida’s history. As Attorney General, Pam Bondi has remained unwavering in her commitment to make Florida the safest state to live, work, and raise a family. When Attorney General Bondi took office, Florida was referred to as the pill mill capital of the United States. Of the top 100 oxycodone dispensers in the country, 98 of them were in Florida. In her first legislative session, Attorney General Bondi successfully fought for tough legislation to shut down all 98 of these unscrupulous doctors and clinics. Attorney General Bondi has also made Florida a national model in the battle against synthetic drugs. She has fought to keep deadly synthetic drugs off our streets through the signing of emergency orders to ban these drugs as soon as they become prevalent in Florida. In 2016, she worked directly with the Florida Legislature to pass the “Florida Comprehensive Drug Abuse Prevention and Control Act.” This all-inclusive legislation allowed Florida to finally keep pace with the manufacturers of these constantly changing and extremely dangerous synthetic drugs. Attorney General Bondi’s battle against human trafficking has led Florida to strengthen state laws, raise public awareness, and provide new resources to victims. She serves as the Chair of Florida’s Statewide Council on Human Trafficking where she has advocated for better care and protections for victims. With the creation of the Council, Attorney General Bondi set a precedent for other states to combat this inhumane crime. 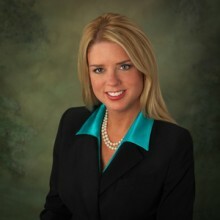 Attorney General Bondi continues to be an advocate for Florida’s consumers. Since taking office, her Medicaid Fraud Control Unit has obtained more than $700 million in settlements and judgments. The attorney general’s participation in a multistate national mortgage suit over mortgage servicing and foreclosure practices resulted in an historic settlement on behalf of Floridians and hundreds of millions of dollars of relief for Florida homeowners. Furthermore, Attorney General Bondi stood up for consumers during Deep Water Horizon where she worked to secure $3.25 billion in total recovery. From her time as a career prosecutor and now in her second term as Florida’s Attorney General, Ms. Bondi has been a relentless champion of justice and works tirelessly to protect the rights and safety of Floridians.